I had nothing planned but writing today. These days are pretty rare. I was just sitting down to my desk when the school called me to pick up a sick daughter. Oh well! I decided to do something writingish while she was lying on the sofa anyway. I uploaded this story that I wrote a couple of years ago. 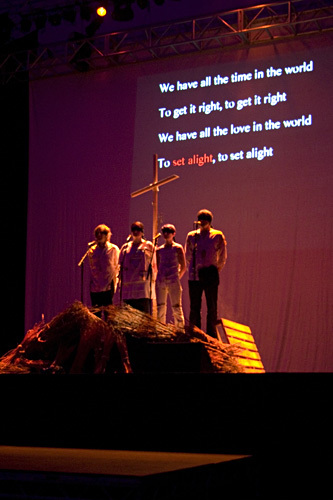 It’s about a teenage arsonist and inspired in part by an event called Pyrotheology that Ikon presented at Greenbelt in 2009 (that’s me on the pyre). So, this is Poetry. I’m off to mop a brow! Last week I posted an interview I’d carried out with Belfast comic book writer, Paddy Brown for an essay I’d been writing about copyright. This week it’s the turn self-produced musician, Kathryn Rose. I asked her about her views on creativity, self production and the use of Creative Commons licenses for the emerging artist. Creative Commons licenses give artists the choice about how and what to allow other people to copy and use in their own work. Paddy had decided against using CC licenses altogether but Kathryn uses them a lot so I wanted to find out what she felt the benefits were for her. Kathryn Rose is a musician from London who normally uses a CC BY-SA license (which is perhaps the most ‘free’ Creative Commons licenses) on her work. She blogs here and tweets under @artsyhonker. Hi Kathryn! Can I firstly ask how you heard about the Creative Commons licenses and why do you use them? Have you ever had any problems regarding copyright? I think I first found out about the Creative Commons license through David Gerard, who’s involved with Wikipedia work, but I’m not entirely sure. I’ve been using them since at least 2006, though. I wrote a little bit about why, here. So far most of my ‘problems’ regarding copyright have been to do with not being able to get permission to use works (on a commercial or non-commercial basis) when the creator is still alive. There is a lot of visual artwork and poetry that I haven’t set to music simply because initial inquiries to the rights managers have been fruitless and I don’t have time or energy to chase things. At that point my options are a) use it anyway and don’t ask, risk getting in trouble b) don’t use it. I don’t like getting into trouble, so generally don’t risk it! 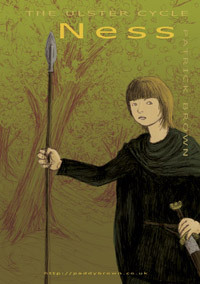 What are your thoughts on self publishing for completely unknown new writers? Should emerging artists and writers who want to be part of a global creative network be looking towards independence (self publishing, for us writers) so that we can then use more ‘open’ licensing? I don’t know that independence is necessarily the right thing, but I think that artists rather than publishing companies should be deciding how their work is marketed. As a musician, I do have the option of going to a recording studio and getting someone else to do recording, mastering and so on. The thing is, I can get a recording studio to do this for a fee, and I can get a publicity company to do publicity-related things for a fee, and so on, rather than having a major label deal with all of that. This means paying more up front but is generally a much better deal for the musician than the label “deals” that exist. The catch, of course, is you have to pay up front. Yes, writers can also self publish in a similar way. I am interested in what the pitfalls of this approach might be though, regarding protection for the artist. As an emerging artist we can take the view that we don’t have anything to lose since we’re starting with nothing. On the other hand, we’re starting with nothing, so how much should we be worried about someone who has more money or clout than we do taking our ideas and making money from them? Or is this simply a paranoid fantasy (it’s a very popular one, as I’m sure you’re aware!). How anxious about the thought thieves do you think we need to be? Well, Creative Commons licenses come with an “attribution” option; someone can’t legally take your story, or a derivative of it, and make money from it without at least mentioning you as the author of the original work. And I don’t believe that illegal copying is, or ever has been, as large a drain on profits as it is often made out to be. Yes, this echoes what many proponents of liberalising copyright have said, that people who makes copies aren’t necessarily going to pay for the same product if they couldn’t make a copy (and of course many people have already paid for the product but are limited as to how they use it- for example a Region 1 DVD will not play in a Region 2 player- so many people feel justified in making a copy as they feel they already paid for the work). What about the ‘sharing’ aspect of CC though. Does using a Creative Commons license mean accepting that it’s fair if someone else takes your work, modifies it slightly, and gets more credit than you for it? At Christmas I did a recording of a piece of music written by a friend; he’d released it under CC BY-SA, which meant that I could put it on my Christmas album (which I put on Bandcamp under a pay-what-you-want pricing scheme) and not worry about paying him for it. What do I get out of that? Well, I got some money, though not enough to cover costs if I price my time at minimum wage. His piece took me about six hours to record and is one of twelve tracks on the album, which earned less than £50 (to be fair, it’s seasonal, my first album, and not my very best singing — and I released every track on Soundcloud before putting the entire lot onto Bandcamp, which was, in retrospect, probably a mistake, but it’s good to learn these things while the stakes are small). What does he get out of it? Well, probably a hundred or so people who wouldn’t otherwise have heard his music, or even heard of him at all, got to hear his piece… so in a way, as someone working in a slightly different niche, I was doing some publicity for him. And because I released the recording under CC BY-SA too, he now has a recording that he could send to people if he wanted to. On the whole. I think “attribution” might be a better word than “credit” for discussing these issues. OK so, although he does not share in your profits he does get accredited which means other people may then be directed to his work which he can then offer for a profit. Interestingly , what you have done here looks like a direct inversion of the current deal in the music industry, where the writer can expect recurrent royalties and the performer only gets paid for their time. Using a Creative Commons license means accepting that you cannot control everything that other people might do with your work. That’s fine, but if you really want that kind of control, don’t publish. Ever. All of these risks exist with “traditional” publishing too. Nobody will steal your ideas if you keep them locked in the bottom drawer of your desk. Yes, and I suppose you could say that, depending on your contract, if a mainstream publisher decides to discontinue printing your work and they still hold the publishing rights to it you might find it ‘locked in a drawer’ to which you don’t have key! The difference is that a traditional publisher *might* sue copyright infringers — if you are bringing in enough money that they think it will be worthwhile. I’d see this as maybe the biggest problem with CC- it cannot protect you from people misusing your work, and where traditional publishing might not stop this from happening, someone who ignores your CC license and misuses your work might be able to get away with doing so much more easily than if you have used a traditional publisher because as an independent you are unlikely to be able to afford to take legal action. I know of a couple of stories of bands and photographers who offered their work for free, non commercial use on various websites only to have the work taken and used by bigger companies for profit. Of course the problem was not the license but the independence of the artist, but they are obviously related. Do you think it’s the case that if you want to be creative in how you offer your work to the world then you must accept that traditional/mainstream producers/publishers will not be interested? You should always read contracts carefully. Never sign anything that limits what you do with work you might create later. As soon as anyone has sole rights to ALL your work you’re in trouble: they can do what they want and if you can’t afford a lawyer to show they’re in breach of contract (if, indeed, they are) you’re kinda stuck with it. Indeed, if you can’t afford a lawyer you’re stuck with whatever people might do, whether signed or unsigned, published in the mainstream or independent! On that uplifting note (! ), I want to thank you for your time, Kathryn. You’re clearly someone who benefits from the freedoms afforded by the CC licenses and I’ve certainly learnt a lot though talking with you on these issues. I wish you well with your work and will continue to enjoy your twittering and blogging! I spent the entire Easter break working on an essay about copyright for my MA (more interesting than it sounds. Really. No, really.) 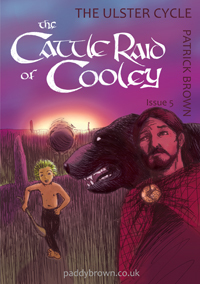 The links between copyright and publishing led me to think of Paddy Brown, a local comic book creator that I met briefly at Belfast Book Festival last year. He kindly agreed to answer some of my questions about self publishing and the Belfast comic scene. Paddy, as someone who doesn’t know much about Belfast’s comic writing scene could you tell me a bit about it and where you fit within it? I was accused of being the “ringleader” of it recently, but if I am that’s a position I’ve stumbled backwards into without ever intending to. Basically, I send out the emails about the monthly pub meet that a bunch of us have at the Cloth Ear, something I took over doing “temporarily” from Stephen Downey when he went on holiday a couple of years ago. It’s a small scene with a lot of talented people dropping in and out of it. 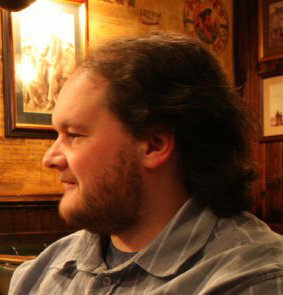 Stephen and PJ Holden are working pros, there are a decent number of small-scale self publishers and quite a lot of people who do short pieces here and there – some of them on Stephen Downey’s website Tales of The…. The Black Market, which was a monthly handmade arts market held at The Black Box, used to be a great outlet for this kind of work, but for a variety of reasons that doesn’t happen regularly anymore. The internet is a big part of it. Sean Doran, who used to make comics in Belfast back in the 90s and now lives in London, told me that back in his day the only people he knew who made comics were the people he was actually working with, but the internet makes it so much easier for people with common interests – particularly interests that would once have been derided as “nerdy” – to find each other. Thanks to that I’m at least as involved in a wider Irish comics scene as I am in the local Belfast one – people I see maybe three or four times a year at comics events but who I’m in touch with online. Dublin writer Gar Shanley has recently corralled a bunch of us into making a satirical romance comic called Romantic Mayhem that’ll be out soon. Myself and Davy Francis are keeping up the Belfast end, and there are contributions from Kildare and Meath and elsewhere. I’m also gradually becoming known outside of Ireland. Lots to check out then! Thanks. Is self publishing a big part of what goes on in Belfast and do you know if that’s typical of comic writing communities? I think so. I’ve been at it on and off since the late 90’s, so has Andy Luke and there’s Debbie McCormack and Gareth McKnight doing Don’t Panic! Comics – I’d say those are the regulars. There are people like Stephen Maurice Graham and Miguel Martin who’ve done a bit of self-publishing, Ann Harrison, who has a background in animation and Malachy Coney who has done some pro work but self-publishes occasionally. From what I can tell that’s pretty typical – there are a few pros work in commercial comics and a bunch of others do stuff that’s either too personal, too left field, too formative, or some combination thereof, for commercial publication, and they’ll self publish. Do you also seek publishing in more mainstream publications? From time to time – no real success so far I’m afraid. I got a very nice rejection letter from the DFC when that was still going. I’ve done a small amount of illustration work and I’m looking to expand into that a bit more. But I’m driven to make comics, so I need that creative outlet. Your passion is obvious and I look forward to the Facebook updates when you’ve put up a new part of The Cattle Raid of Cooley. Do you publish all your work online? Is there anything you don’t/won’t put out there, and if so, why? At the moment, it’s pretty much anything I want people to be able to see. If something’s due to be published in print by somebody else (and I have a small number of such pieces upcoming) I won’t put it online because I don’t want to do the publisher out of sales, maybe just a snippet as advertising, but otherwise I don’t see any downside to putting my work online at this stage of my artistic career. I serialise my work online because I’ve found that knowing people are waiting for me is a very good way of motivating myself to get the work done, and the more work I do, the better I get. That’s very interesting and something I had briefly considered myself with my novel. Always a bit too scared to do it though! It’s also a form of networking – it gets my work in front of a potentially enormous number of people, builds an audience, gets my name and my work more widely known. It doesn’t, as yet, make me any money – the only money I make at the moment comes from selling the printed copies – but if there was no internet I wouldn’t be making much money anyway, because who would know my books were there? Once I’m a best-selling published author I can worry about what goes online and what doesn’t. When I began to look into this kind of thing on the internet Google threw up lots and lots of results from writing forums where people were getting very anxious about putting their work online. It seemed like there were a couple of issues. Firstly, people were concerned that they should be getting paid for their work (and how could they sell it, even as self published, if they were putting it up for free? ), and secondly the fear that their ideas were going to get snapped up by someone bigger and stronger than them and they’d never be able to get the credit for their work. Are there similar debates in the comic writing community? Is there a lot of anxiety about (1) making money and (2) intellectual property? There’s not an awful lot of money in comics, even in commercially published ones, and most of us are doing it because it’s a compulsion. I remember PJ Holden saying when he got his first commission for 2000AD, he was so chuffed just to be working for them he forgot to ask how much they were paying. He’s very professional about it now but it took him the best part of a decade before he was earning enough to give up the day job. As for copyright, in commercial comics, despite the campaigns for creators rights in the 80s and 90s, it’s still more of less a given that everything you create belongs to the publisher, and they can give your characters to other writers and artists to continue. *Gasp* Somehow I knew this but hadn’t ever considered it from the artist’s point of view. You get the occasional debate online whenever there’s a copyright issue in the news – DC not paying Siegel and Schuster’s heirs what they’re legally due for Superman and forcing them to sue for it, or producing Watchmen spin-offs against the wishes of Alan Moore and the spirit of the original contract – but the fans follow publishers and characters like they follow football teams and don’t really care about the business ethics, and for a freelancer, working on company-owned characters pays better than creator-owned ones, so that’s what most do. Over on the non-commercial side people do their own thing but they don’t expect to make much money at it. Ideally, yes, we should be getting paid for our work, but unfortunately there’s no neutral arbiter deciding what the value of a piece of work is and making sure we’re recompensed – it’s only worth what someone’s prepared to pay for it, it’s up to us to convince them, and we’ll never convince them if they don’t know it’s there. Clearly you’re not concerned about people just lifting your work from your website and either printing it out themselves for free. Or are you? I ask because, apart from you, the only people I’ve heard of who put their writing online for free tend to be quite well known. As far as I know Cory Doctorow had already been published by a mainstream publisher before negotiating that his work would also be available for free online, and Neil Gaiman’s experiment in putting stuff online for free proved lucrative for him and his publisher, but he is Neil Gaiman- I’m thinking he could probably sell his breath on ebay if he wanted to! I’m just wondering if publishing online for free, for someone like me who is just starting out, serves as a useful PR tool in your opinion? Gaiman does talk a lot of sense, particularly about not dithering but sitting down, doing the work, finishing it and learning from it, but when it comes to money he’s in a very different position to most of us. Putting your work online is a very good way of getting your name and work known, but there’s a difference between putting artwork online and putting text online. Art on the web is only 72dpi, which isn’t print quality, and while I’m putting low-resolution images online, I still have the high resolution images to exploit. Text isn’t quite the same – I can copy and paste text from the web into a word processor and make a print quality document. You get the occasional fine art chancer doing the Lichtenstein thing with less wit and skill, lifting other people’s work out of comics and claiming it’s some kind of “found object”, or people who do single panel funny cartoons might find their stuff reposted without credit on ICanHazCheezburger. But I think we can get a bit too paranoid about copyright – the world works on trust more than some might think, and generally, copyright is respected. That’s something I had started to suspect and it’s great to hear from an independent artist who has had good experiences with trust. As far as I’m concerned, copyright means what I create is mine unless I sell it to someone else. I put a little copyright notice on my work and trust that people will respect that, which so far they have. 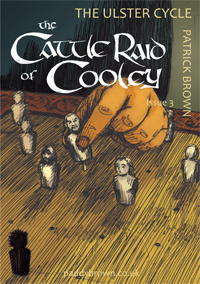 The Cattle Raid of Cooley is based on a very old story that nobody owns, so I can’t complain about anybody else doing their own adaptations, but I’d prefer them to do it their own way rather than sharing or building on mine, so the Creative Commons thing doesn’t really appeal to me. I can imagine contexts in comics where it might work, but I can’t think of anywhere it’s been tried. As far as having your work stolen is concerned, like I said, I think that’s a lot less likely than some might think. Thinking about it, I have several safeguards – (a) the low resolution of web images, (b) a copyright notice on every image, (c) a long-form story that would take a fair amount of effort to rip off, (d) a distinctive drawing style that would be difficult to imitate, and (e) a personal presence, including a recognisable face, on the web – hopefully if people are aware there’s a person behind the work, that’ll discourage them from taking my work lightly. Thanks so much Paddy. 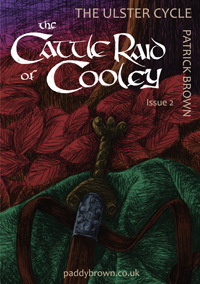 I’d encourage comic book fans (and indeed fans of Celtic mythology) to check out your work. It’s been lovely to talk to you and encouraging to hear about your experiences of self publishing. I wish you lots of luck in the future. I have just watched the documentary film ‘This Is What Love In Action Looks Like’, due for general release in the UK in May 2012 [Edit- you can now buy this movie from Amazon]. 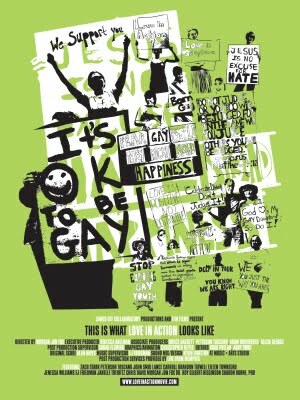 Directed by Morgan Jon Fox and distributed by TLA Releasing, the documentary tells the story of what happened when a young man named Zach Stark came out to his parents who subsequently decided to send him to a residential program called ‘Love In Action’ to cure him of his homosexuality. Anxious about their plans, Zach blogged about it on the internet and what happened next caused a national media debate about ‘ex-gay’ programs and their involvement with minors. Zach’s friends forwarded his blog to other people and what began as a few outraged teenagers passing around some information ended up being an eight week protest outside Love In Action in Memphis, where Zach’s friends, their friends, their friends’ parents and psychology professionals to name but a few gathered in support of the young people who had been sent to Love In Action in the hope that they might graduate the program as people who had left behind ‘the gay lifestyle‘. I find it very hard to write about this kind of thing. I have sat in meetings alongside proponents of ‘ex-gay’ therapy and I always find it difficult to speak. It’s not that I’m afraid to speak (I mostly find that I have trouble shutting myself up when faced with an opposing view, as many people will testify…), I think it is more of an emotional reaction; there is an anger and deep sadness about the world that I find very hard to express when I think about the wonderful LGBT teenagers that I know, and when I think about my own family and the children in it growing up in a world where they are yet to discover who they are and whether or not they will be accepted. I have to say, there have been meetings that I haven’t gone to because the awful, terrible reduction of the stories of people I love to some kind of debate is something I find very hard to deal with, no matter how polite people are being about it. So I watched this documentary and heard these articulate young people who weren’t prepared to be dumbfounded and depressed and who figured out a way to speak into the lives of people who were taken away and cut off from the world against their will, and I felt that this was the world I want to belong to; where love speaks in love so that it is impossible, even for the then director of the Love In Action program, not to feel inspired to figure out what caring for someone really means. You need to see this film if you are not sure whether ‘reparative’ therapy is really harmful or not, but it’s also an excellent example of how to care for people as a collective. Many thanks to Peterson Toscano, one of the associate producers of the film and a constant source of inspiration and joy in my life.